Jennifer Loring’s short fiction has been published widely both online and in print, including the anthologies Tales from the Lake vol. 1 and vol. 4 and Nightscript vol. 4. Longer work includes the novel Those of My Kind, published by Omnium Gatherum, and the novella Conduits from Lycan Valley Press. Jenn is a member of the International Thriller Writers (ITW) and the Horror Writers Association (HWA). 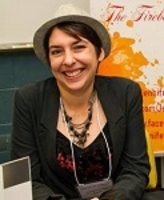 She holds an MFA in Writing Popular Fiction from Seton Hill University with a concentration in horror fiction and teaches online in SNHU’s College of Continuing Education. Jenn lives with her husband in Philadelphia, PA, where they are owned by a turtle and two basset hounds. Jennifer's story, "Dollhouse," was published in A Plague of Shadows: A Written Remains Anthology.